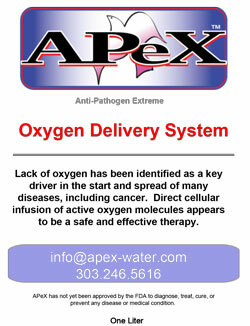 The creation of APeX Water derives from two paradigm-shifting scientific/medical discoveries: the first comes from the understanding of specific properties of minute particles of silver that make it an ideal delivery system for carrying oxygen to pathogenic cells; the second arises from Otto Warburg’s discovery in the 1930s that cancer cells thrive in oxygen deficient environments. READ MORE…. APeX Water adds oxygen to weak oxygen deprived cells to strengthen them to reverse a condition called Hypoxemia. The combining of water and oxygen, as a therapeutic intervention, seems intuitively right as a method of introducing natural medicine to the body. The human body itself brings together the two components, water and oxygen, and their ubiquitous presence in our bodies is absolutely essential to life. READ MORE…. Healthy terrain consists of two internal factors: 1. Alkalinity 2. Electrical Charge And, contributing to a healthy terrain (or not), are two external factors: 1. Nutrition 2. Toxins Electrical Charge (voltage and + or -): All the tissues of the body are made of cells. Every function that occurs in the body is due to the activity of cells. READ MORE…. A distribution imbalance between positively and negatively charged elements creates what is referred to as a “potentiation differential.” When APeX Water enters the body, the negative charge of the nano-clusters is potentiated by, and then drawn into, the positively charged pathogens and/or pathogen-infected cells. READ MORE…. NOTE: This video is captured in extreme slow motion, because the destruction of the pathogenic cell happens so quickly, it is impossible to capture at normal video speed. At the 30-second mark you can see where we set the microscope to start viewing. You can see that the live blood cells are looking sluggish and stuck together, also known as Reuleaux. At the 45 second mark, we added the one drop of APeX Water. You can see that some cells are so unhealthy that they are sticking as the APeX Water is added, but at the 1:17 mark you will see that the APeX Water has caused the unhealthy cells to cease to be viable. At the 2:54 mark you can see that the white blood cells are also disintegrating from whatever pathogens they were carrying inside. We continued to move the slide to see what APeX Water had done for the blood, and at the 5:32 mark you can see that the blood is still moving freely.